How do I Wire a Twin Fluorescent? Twin fluorescent fixtures use a rapid-start ballast to connect the two fluorescent tubes. The rapid-start ballast is usually wired through a switch to the normal house wiring. 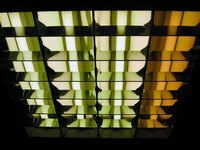 A typical twin-fluorescent fixture will use two 40-watt fluorescent tubes, although many different sizes exist. Fluorescent lighting is more energy-efficient than incandescent bulbs because they waste more energy due to heat loss. Mark the terminals at the ends of the two fluorescent tubes as follows: First tube: label the two terminals at one end "A" and "B" and the two terminals at the other end "C" and "D." Second tube: label the two terminals at one end "E" and "F" and the two terminals at the other end "G" and "H."
Connect the two red wires from the ballast to terminals "A" and "B." Connect the two blue wires from the ballast to terminals "C" and "D."
Connect one of the yellow wires from the ballast to both terminals "C" and "G."
Connect the other yellow wire from the ballast to both terminals "D" and "H."
Remove power from the circuit or turn off the switch for the fluorescent light. Connect the black wire from the ballast to the black power wire from the household wiring. Connect the white wire from the ballast to the white ground wire from the household wiring. Restore power. Use wire nuts to connect the ballast wiring to household wiring. If the fluorescent fixture is pre-wired, use wire nuts to connect the ballast to the fixture wiring. If the fixture is pre-wired, it will already have jumper wires between the two tubes to allow a single connection to the ballast wiring for the yellow wires in steps 4 and 5.